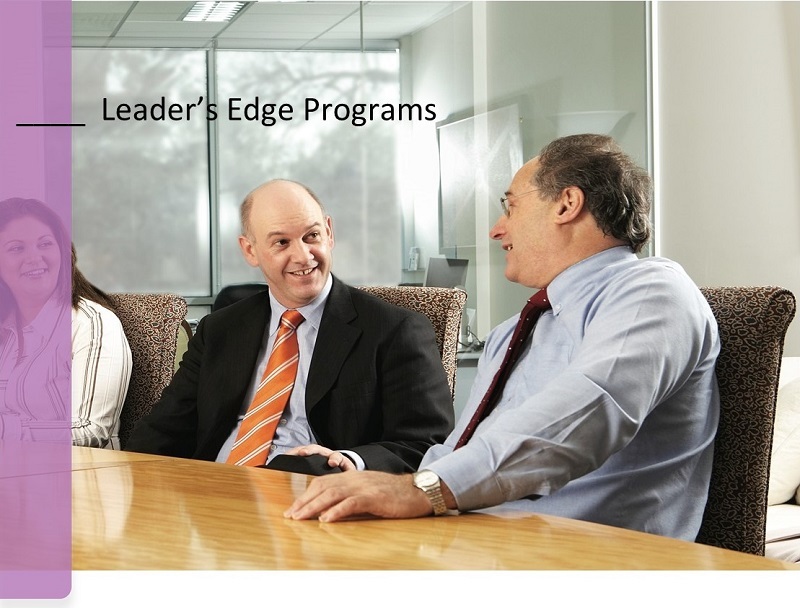 What is the Leader’s Edge Program? We have created this Program to provide short term support and guidance to leaders who are struggling with an issue or obstacle in their business or personal life. We work with you one-on-one or as a team to create a clear strategy or path to get through this obstacle or hurdle and achieve the outcome you desire. To maintain effective leaderships, CEOs and executives need to bring a number of key skills and qualities to the table, offering strengths in 10 specific areas; adaptability to change, strategic thinking, communication, integrity, openness, vision, delegation, positivity, self-awareness and motivation of others.In their path to success, executives often face challenges in these core leadership areas. Such challenges can present significant obstacles in accelerating the performance and results of organisation and achieving its goals. That’s where the executive leadership coaches at nLIVEn can help. Our Leader’s Edge executive leadership coaching programmes are designed to strengthen the core leadership skills of business executives by learning how to use our coaching as an effective and fundamental tool in their approach to management. Delivered by the most experienced teams in executive leadership coaching Melbourne and Sydney wide. As the top provider of executive leadership coaching Sydney and Melbourne wide, we have developed a superior array of tools, resources and information which help you to design and create a plan customised to your specific situation and needs. Our carefully formulated electronic templates are designed to allow you to organise your information and present the contents of your plan in a clear and structured format. Develop your goals, dreams and vision into a clear working plan. Our leadership courses include four one-on-one mentoring sessions with a highly experienced nLIVEn executive coach. Our team not only hold a number of coaching and business qualifications and offer years of expertise, but are or were successful business owners too. Each mentoring session provides a unique opportunity to learn leadership skills from a seasoned business executive. Critical to the success of our leadership programs is the ongoing access to experienced executives. Our leadership programs offer both telephone and email support between sessions (during business hours) to assist you with overcoming any obstacles you may encounter in preparing your plan or enforcing changes. Being able to lead your staff and business to success is a vital element of any executive or CEO role. However, no matter how successful you are at fulfilling your role, we could all do with a little professional help and guidance, every once in a while. At nLIVEn, one of the top executive leadership coaching consultancies in Australia, we’ve been helping execs all over the country to fine tune their skills, overcome obstacles and lead their companies or organisations to success with our ‘Leaders Edge’ and ‘Professional Partnership’ programs. Whether you’re experiencing an issue in your business or personal life, our leadership training will give you the skills you need to negotiate your way to success. By working with our executive leadership coaches on either a one-on-one basis or as a team, we’ll help you to learn team leadership skills that will make it easier to create effective strategies that will more consistently result in positive outcomes. Skills in areas such as strategic thinking, communication, adaptability to change, integrity, vision, positivity and self-awareness. We’ll also show you how to develop your ability to motivate others and how to build a strong culture within your team. Our leadership courses and coaching have been specifically designed to give you the tools you need to strengthen your core leadership skills. We’ll demonstrate how our coaching can be utilised to improve your decision making, identify opportunities, alter your career path and goals, and assess and develop business ideas, all while achieving a better balance between work and home life. After all, you can’t be a great leader if you’re stressed. And, as it’s delivered by some of the most qualified, experienced and respected teams in executive leadership coaching Melbourne and Sydney-wide, you can rest assured that you’re going to be getting the best leadership coaching on the market. At nLIVEn we tailor our leadership courses to suit you. That’s why you’ll also receive 4-36 one-on-one mentoring sessions per annum with a highly experienced executive coach, together with ongoing support, by both email and telephone. Our aim is to help you to take your goals, your dreams, your vision and aspirations and turn them into a clear working plan that will get you where you want to be in your career and life. Are you ready to walk the pathway to your prosperity? You have the ability to become a pioneering leader, capable of taking a business from successful to significant. Reach your full leadership potential with the help of nLIVEn. Contact our executive coaching team today for a free, no obligation consultation. To find out more about any aspect of our leadership coaching program, or to arrange a free, no obligation consultation, get in touch with the team at nLIVEn today by calling (03) 9889 7777. At nLiven, We have one of the most qualified & experienced team for executive coaching in Melbourne & Sydney. We’ll be happy to organise a complimentary 30-minute session with one of our experienced executive coaches to discuss how we can take your leadership skills to the next level. or whatever you choose to discuss. Inside the Leader’s Edge Program, your experienced nLIVEn coach will assist to formulate your goals, dreams, aspirations and vision into a clear working plan. Working together, we make positive changes to discover, design, develop and deliver your own unique edge and vision for success. 3FOUR x ONE-ON-ONE COACHING OR MENTORING SESSIONS with a senior coach/mentor with over ten years of experience. 4SUPPORT via telephone and email between sessions (business hours) to assist you overcome any obstacles you may encounter in preparing your plan. Choose the best package for your circumstances. Process payment in full. Fill in and submit registration forms (either paper or online).